One of Mom’s famous desserts was a Rocky Road Pizza! It super delicious & very easily to make, so I’ve made it one of my go-to recipes. When I make it, people often ask for the recipe, so I’ve decided to share it with you all today! Spray pan with non-stick spray. Roll cookie dough out in pan making it as thin as possible. Depending on your pan size, you might have dough left over (I usually don’t!). Bake at 350 degrees. After 10 minutes, watch carefully until brown. Sprinkle pizza with marshmallows, then with nuts, and then with chocolate chips. Bake until melted- watch carefully (I usually put it back in the oven for about 2 minutes, check it, then 1-2 more minutes depending). Remove from oven and add caramel. I hope you all enjoy this very yummy, super easy, Cindy approved recipe! 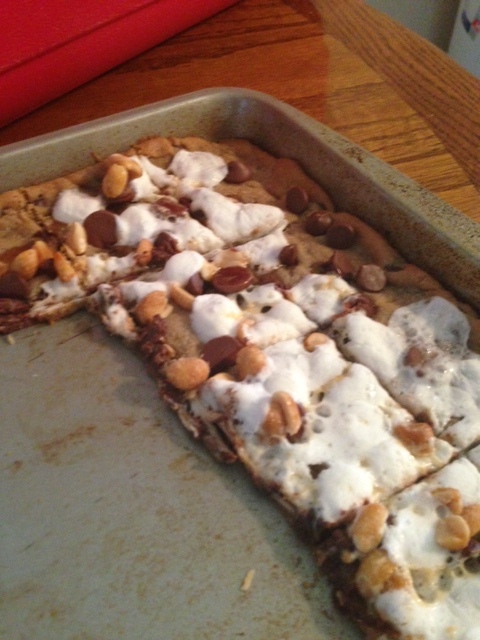 Here’s a picture of a Rocky Road Pizza that had already been dug into by our college students! Previous postDoes God Answer Prayer? Mmm can’t wait to try this!